Sherman Criminal Defense Lawyer - Grayson County, Texas DUI Attorney - Micah Belden, Esq. My name is Micah Belden and I am proud to be a board certified criminal defense trial lawyer from Sherman, Texas, born and raised in Grayson County. I regularly try cases for a living in Grayson County, Collin County and Fannin County. My trial record speaks for itself. I also personally sue law enforcement in appropriate cases on behalf of innocent clients. I’m that vicious. I also personally handle all aspects of your case and will not hand it off to an associate lawyer. When you hire me as your Sherman criminal defense lawyer, you get me. 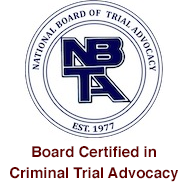 I am one of the few lawyers to be Board Certified in Criminal Law in Texas and in Criminal Trial Advocacy by the National Board of Trial Advocacy. I am one of 55 trial lawyers for people in America who are July 2009 graduates of the annual three-week-long Gerry Spence’s Trial Lawyer’s College in Wyoming, and one of only two graduates in Grayson, Cooke or Fannin Counties combined. I have served my brother criminal defense lawyers around the State of Texas to the board of the Texas Criminal Defense Lawyers Association. I went to the top-tier University of Houston Law School, was on its national champion Mock Trial Team, and went to Texas A&M University for undergraduate (and was on the Dean’s list). If you have been investigated, arrested or charged with a crime in North Texas, you need to call me now for a FREE CONSULTATION to talk about your case at no cost. It is important that you talk to NOBODY but a certified criminal defense lawyer about the facts of your case for now. The attorney-client privilege only exists between an attorney and his client/potential client. Anything you say to anyone about your case except a defense attorney or his employees (and without third-parties present) can probably be used against you in court. Remain silent and call a Sherman criminal defense attorney. The judge and prosecution may try to get you to plead guilty without talking to a lawyer, which is unwise when a defense lawyer will give you a free consultation. This is still America (for the most part), so although charged with a crime, you are presumed innocent by law and must be acquitted of your criminal charge if the State cannot prove you guilty beyond any reasonable doubt to an impartial jury of your peers. The fact that you are arrested or charged is not evidence against you. My entire reputation is on every criminal case I handle, and I will do everything in my power if I am your lawyer to win. I do not back down from Federal or State judges or the prosecution on doing what’s right. I have won jury trials from DWI to murder. I must warn you to make sure you are represented by an experienced board certified criminal lawyer who cares deeply about fighting and winning for you. I have petitioned in the Supreme Court of the United States regarding a local lawyer’s denial of his client’s absolute right to testify in a Federal drug case. If you lose because of your lawyer, it is almost impossible to do anything on a direct criminal appeal and takes forever to do anything on a post-conviction writ (writ of habeas corpus). The Federal and State courts around the nation deem most criminal attorney errors and judge errors “harmless,” and uphold convictions despite your rights. The best time for you to win is during the trial process, so make sure you get a Sherman criminal defense lawyer who knows the criminal law and the courtroom. Thank you for visiting my website and I hope you find it helpful. It is, like me and other dedicated trial lawyers, a continuing work in progress. Proudly Defending the Wrongfully Accused and Overly Accused in Sherman, McKinney and Bonham, Texas. Aggravated Assault (2 counts) Not Guilty Jury Verdicts – 2014 State v. F.W. "Micah is a top notch attorney and is definitely a go to guy in North Texas. I am proud to endorse Micah."